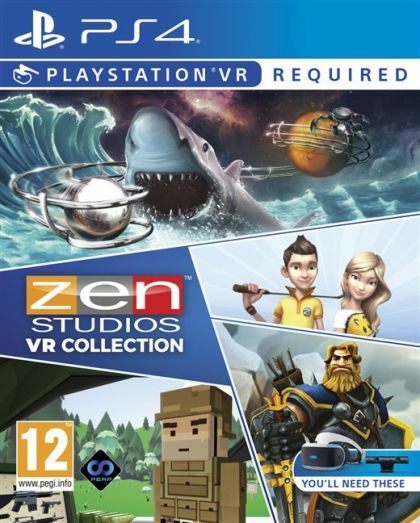 The Collection includes Out of Ammo, CastleStorm Virtual Reality, Infinite Minigolf VR, and Pinball FX2 VR for PlayStation VR. Infinite Minigolf enables you to create, share and play on an unlimited number of minigolf courses. Whether you want to play in a competitive tournament or complete a series of challenges, Infinite Minigolf is the gift that keeps on giving. Gaming Age said in their review, Infinite Minigolf "looks fantastic and the control is perfect. Zen Studios has a winner here." CastleStorm Virtual Reality puts players on the field of battle as they engage in castle vs castle combat with Pit knights, soldiers, archers and griffins. You're always up close and in the midst of the action in this beloved tower-defence, RPG adventure as PlayStation Lifestyle put it "CastleStorm VR does amazing things with virtual reality" and they "hope other developers look at (it) as they create their own VR experiences." Out of Ammo is a VR strategy game where you fight against waves of soldiers, building defences and issuing orders. All while tactically making sure you don't run out of ammo. COG Connected think Out of Ammo is "a fun, cute, violent VR first-person shooter that (we) definitely recommend to PSVR owners." And finally Pinball FX2 VR, the crown jewel of the Zen Studios VR line-up, includes advanced physics, 3D graphics and original tables. Pinball FX2 VR will come with "Secrets of the Deep", "Mars", and "Epic Quest". As YouTuber METALJESUSROCKS puts it "This is the coolest experience ever!"